Japan celebrates New Year, or Oshogatsu in Japanese, on the 1st January. It’s a particularly important holiday for Japanese families who gather together often in their hometowns to celebrate. The traditions are a mix from Shinto, Buddhist and modern origins. Plenty of preparation goes into the two week celebration and ideally no one should work on New Years day so you will find many non essential services closed. It’s a day to be happy and thankful, not busy or anxious. Here are a few of the Japanese New Year traditions I’ve picked up on during our visits to Japan and from Japanese friends. Ahead of the new Year the home is thoroughly cleaned. This is done in late December and traditionally is about beating out the dust from the tatami mats but goes further to a full clean and even disposing of broken furniture and other household items. By getting rid of last years dust and dirt you don’t carry that into the new year. My favourite is the Kagami Mochi or mirror rice cakes. 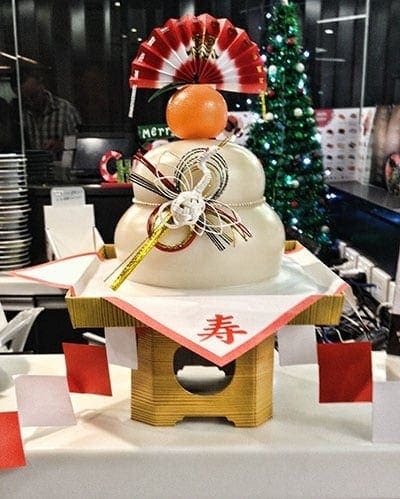 There is a smaller mochi cake sitting on top of a larger mochi cake with a bitter orange (daidai) with leaf attached that sits on top of that. 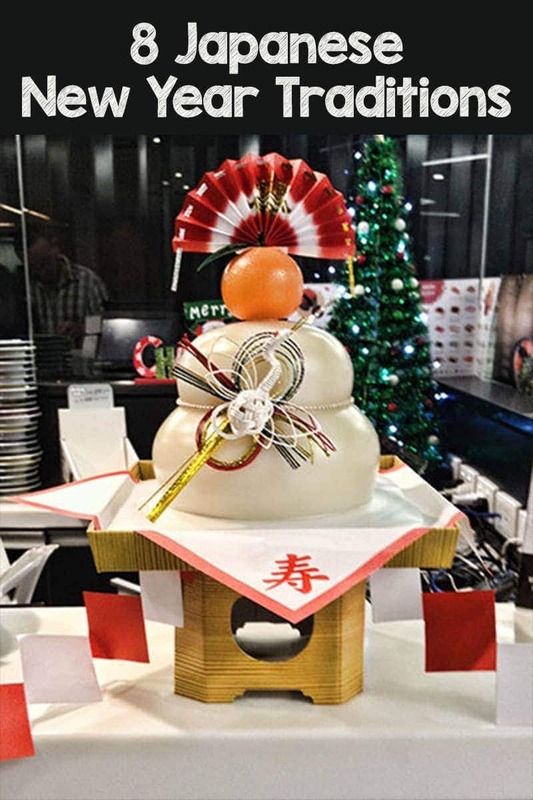 The two mochi represent the past year and the new year while the fruit represents generations of the family. Together it represents the continuity of one generation to the next. On the second weekend of the new year the mochi are broken, cooked and eaten. The daidai are often plastic and the mochi plastic wrapped as in this photo. A variety of different decorations are displayed inside and at the entrance to the home at this time. Green plants representing new life and bamboo for honesty feature heavily. While the western world generally sends Christmas cards in Japan the equivalent is the New Years card, it is ideal for the card to be delivered on New Years Day and the postal system makes every effort to ensure that as many as possible are. No tradition can be complete without the right meal so on New Years eve, the 31st December, a special meal is served of the buckwheat noodles. Buckwheat can withstand harsh growing conditions and because of that this meal represents strength and resilience needed to face the new year. Eating your Toshikoshi soba may ensure a long life. On New Years ever Buddhist temples across the country will ring the temple bells 108 times. The number 108 is important to Buddhists, it represent the 108 human desires which are believed to be the cause of all suffering. With each toll of the bell one of those human desires and suffering is removed leaving people cleansed to begin the new year. 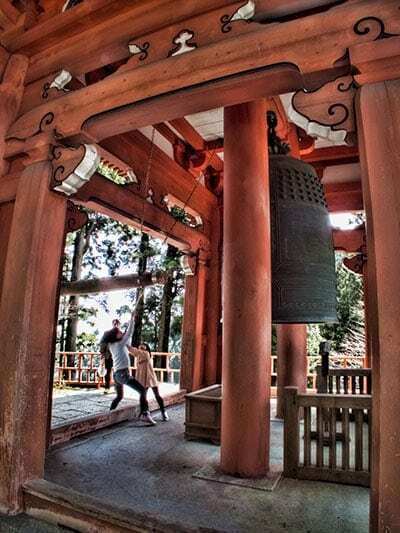 At some shrines the bell is rung by the monks while others allow members of the public or public figures to do it. First’s are important in Japanese culture and specifically the first sunrise of the year. Many people travel considerable distance up mountains and to other vantage points to see the first of the suns rays on the new year. Some will also take advantage of the fresh start the new year offers to make new years resolutions similar to the western tradition. Some great natural vantage points to see in the first rays of the New Year include Mt Misen in Hiroshima, Mt Hiei an easy train ride from Kyoto, and Owakudani in Hakone. Within the first couple of days of the new year it’s usual for the family to visit the shrine together. It may be a local shrine but families often travel further away to a major shrine in a nearby town. 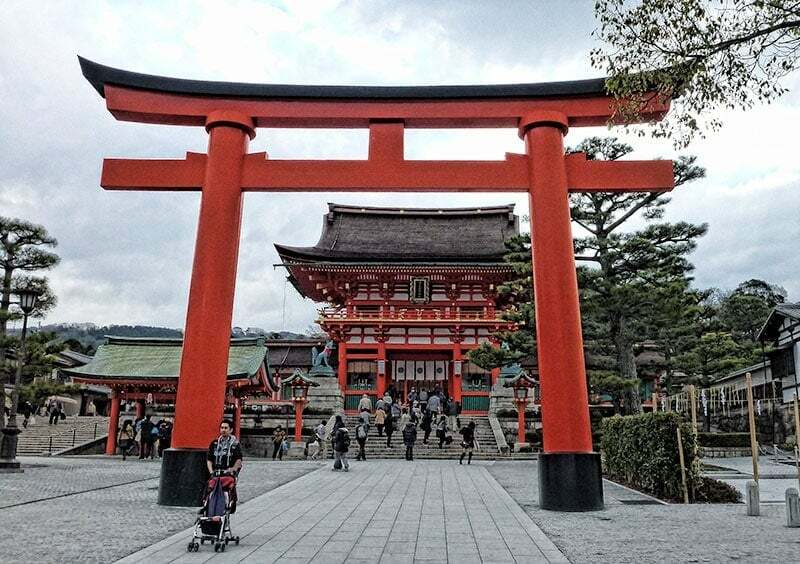 Many travel in from Kobe and Osaka to Fushimi Inari shrine (pictured) near Kyoto is extremely popular and crowded during those the first few days of the year. At the shrine prayers will be made in the usual way and amulets and omamori purchased. 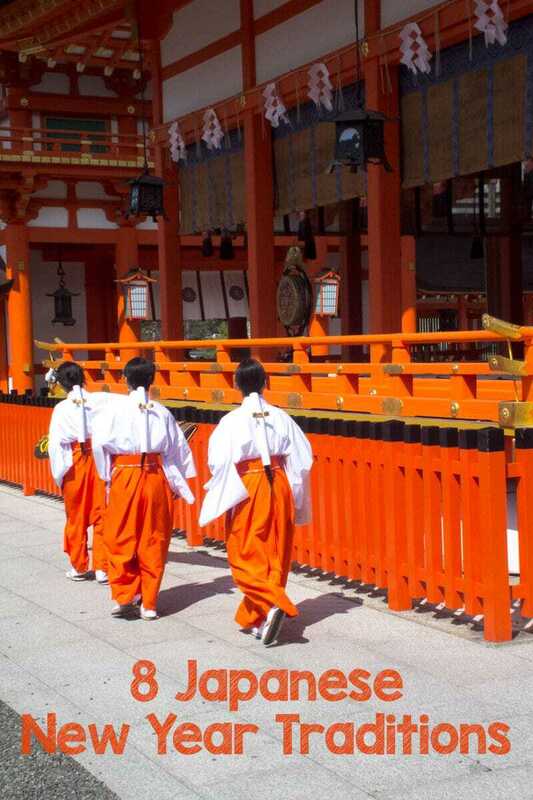 Shinto shrines are fascinating and visitors are welcome, if you’re planning to head along you might be interested in some additional information on Shrine etiquette and traditions. The larger and head shrines are particularly popular and festive on the first days of the new year but others will go to local shrines or ones that have special meaning to them and their family. 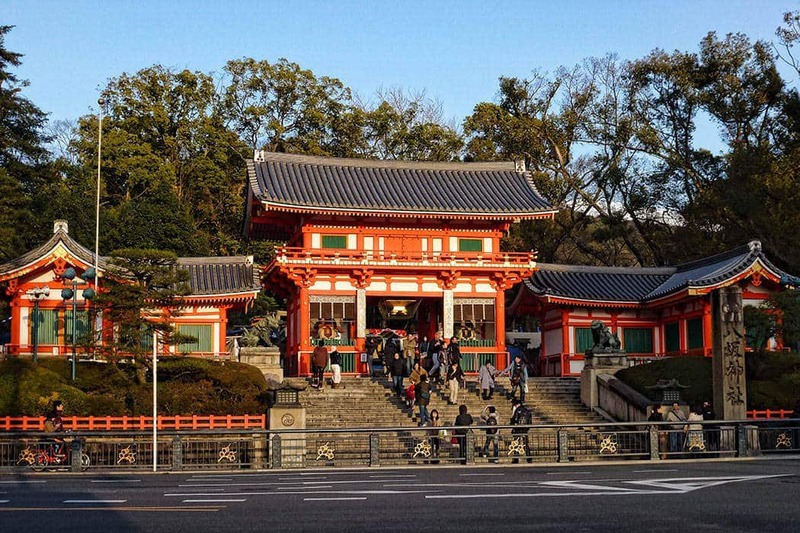 Besides Fushimi Inari some other options are Yasaka Shrine in Gion, Kyoto, Meiji Shrine in Tokyo. the beautiful Itsukushima on Miyajima Island in Hiroshima or Hachimangu Shrine in Kamakura. On the 15th January the new year celebrations end. Decorations are taken down and taken to the shrine together with the previous years talismans to be burned in ritual dedications. This ritual farewells the Toshigami. The Toshigami is the deity who was guided by the placing of the decorations to bring the new year and deliver it together with luck, prosperity and good fortune to the family. Amazing blog post – love all the traditions that are still practised today. It’s interesting to see how different cultures celebrate Bew Year. Japanese New Year looks like an awesome celebration. Travelling to Japan is on my travel bucket list. The Japanese do decorations and packaging beautifully. I love your photo of the Kagami Mochi. I remember ringing one of those Buddhist bells when my boys were young. The boys loved it and I had quite a time of it trying to drag them away. Thanks Lyn. Happy new year to you. Absolutely love your post and learning about other country’s tradition. Very interesting! I know that New Year’s is a pretty big deal in Japan, so nice to learn about all of the traditions 🙂 Thanks for linking up with #WeekendWanderlust! I do love some of the customs of other countries, so thanks for this one on Japanese traditions.